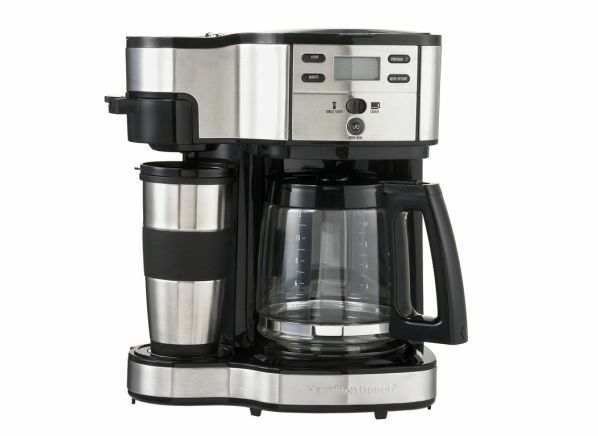 "The Hamilton Beach 49980A is a simple, sophisticated 2-way brewer coffee machine." The Hamilton Beach 49980A is a simple, sophisticated 2-way brewer coffee machine suitable for anyone who desires good tasting coffee from an almost effortless process. It’s affordable too, priced between $60 and $90 but delivering on quality. The 49980A model is one of the lighter coffee machines in size, weighing 11.85 pounds with the dimensions of 13.9 (height) x 12.23 (width) x 11.08 (depth) inches. Therefore, this coffee machine can easily be stored on any countertop without taking up too much space. The Hamilton Beach 49980A can be used to make up to 12 cups of coffee through its carafe or makes a single-serve coffee on its single side, meaning it's versatile and a worthwhile appliance to have. This sleek coffee machine comes in a black and stainless-steel finish, so it will fit into any style of room. Most of the 49980A’s finish is black, meaning it’s super-sleek and won’t stand out too much, but still retains its elegance as a chic coffee machine. The digital display screen on the Hamilton Beach 49980A has a cool blue background, displaying the black numbers clearly. The buttons on this coffee machine are simplistic, but they’re easy to read and link in with the overall chic design of the 49980A. They’re not touch screen, but as the Hamilton Beach 49980A is one of the more modest coffee machines out there, they don’t need to be. Compared to Cuisinart coffee machines, the Hamilton Beach pulls off a sleek appearance quite well actually. The overall appearance of this coffee machine makes it a smart piece of equipment to have in your home. Hamilton Beach is one of the leading manufacturers for small kitchen appliances, so it’s no surprise their 49980A coffee machine model is small in design but big in quality. Versatility is a valuable feature for a coffee machine to have, so it’s good to know the Hamilton Beach 49980A can adapt to suit the consumer’s needs. The 49980A comes with two ways to brew your coffee, either as a single-serve for one cup on one side, or to brew a whole pot which serves up to 12 cups of coffee in one go on the other side, thanks to the glass carafe included. Hamilton Beach has also added two water tanks with the 49980A. They hold the specific amount of water for each function, so if you only want a single-serve cup of coffee, you have to use the one water tank. You can alter the brew strength on the Hamilton Beach 49980A coffee machine to have either the standard flavor or select the bold option to give a stronger, more intense flavor to the coffee. Many customers have reported the coffee brewed from this machine is excellent quality, so there are no issues with the taste of the coffee from this machine which is fantastic. There is also the option to use either ground coffee or soft pods with the 49980A. This is great as it gives you the choice of one or the other and comes with a mesh filter for ground coffee for the carafe side as well as the single-serve side. On the single-serve side of the Hamilton Beach 49980A, the only downside is that it’s not compatible with K-cup coffee pods, which is a shame considering they are very popular. However, this coffee machine is compatible with various other soft coffee pods that are readily available, so the fact K-cups can’t be used with it is certainly not a huge problem by any means. The single-serve side of the Hamilton Beach 49980A coffee machine also has an adjustable drip tray, meaning you can fit any sized mug underneath for the perfect cup of coffee. This is very useful if you needed to make a coffee for a trip out somewhere, as it comfortably accommodates the much taller travel mugs as well as the smaller cups too. This is a great feature that not all coffee machines have and means it can brew up to 14 ounces of coffee in one go. The 12-cup coffee maker side of 49980A comes with the extra-large water tank with measurements on the side of it, making it fit to brew a much larger quantity of coffee. The carafe can also sit on a hot plate to keep the brewed coffee at the optimum temperature. Although the hot plate can’t be adjusted in temperature, it does keep the coffee hot enough, so this would be an added feature that’s not needed. You can also program the Hamilton Beach 49980A to make your ideal coffee up to 24 hours in advance, which is an advantageous feature to have, especially if you want to wake up to a freshly brewed cup of hot coffee! One of the great features on the Hamilton Beach 49980A coffee machine is how easy it is to use. It’s simple features and comfortable design means no confusing technological features to get your head around. This coffee machine can be as simplistic as you want to make it; if you want a single-serve brewed cup of coffee, it’s easy to do. If you’re making a stronger brew for a large group of people, this is programmed through a few simple clicks of the buttons. The 49980A is easy to get on with and comes with a two-hour automatic turn off function, so Hamilton Beach understands the importance of safety and energy efficiency! The 49980A is also easy to clean, with removable parts such as the carafe and mesh filter making it a simple task to complete. The stainless-steel and black finish also make a simple wipe-clean of the surfaces possible, so the coffee machine can easily be kept clean. Its smaller size is also really beneficial to the cleaning process, as it’s quick and easy and customers rate the 49980A for its ease of cleaning. If you’re looking for a coffee machine that brews excellent coffee and is easy to use, the Hamilton Beach 49980A is the one for you. It’s not as tech-savvy as other models, but the 49980A is perfectly functional. This coffee machine comes with a 12-month warranty, has two brew options on offer and is ideal for a single cup of coffee or larger quantities that are efficiently kept warm in the carafe by the hot plate. Overall, the 49980A coffee machine is a simple but high-quality machine that does everything you need it to, and you can’t argue with the price for what you get for the money.